BEAVERTON, Ore., Jan. 13, 2016 /PRNewswire/ — CTL, a manufacturer of innovative 1:1 solutions for education, announced today they have been awarded a contract with the State of Nevada Department of Education to provide a comprehensive education technology package to middle schools participating in the Nevada Ready 21 program. CTL will provide Chromebooks, networking wireless infrastructure, a rich suite of apps and online tools and a robust package of service and support for the Nevada Ready 21 (NR21) program. Approved by the Nevada Commission on Educational Technology in 2014, NR21 is a state-funded, 1:1 digital learning program. NR21 will provide Nevada students an equitable, technology-rich education while supporting educators to create an engaging and personalized learning experience. The initial phase of NR21 targets middle schools, while future phases will target high schools. “We’re really excited about the program we’ve put together with CTL and can’t wait to see what it enables Nevada’s students to create. We appreciate CTL’s flexibility in working with us to design a great digital learning initiative,” said Andy Jorgensen, Program Director for Nevada Ready 21. “CTL has a strong history in education dating back to our 2goPC line of classroom-specific devices, which we introduced in 2009. Today we have four Chromebook models designed specifically for education and CTL is quickly becoming recognized for their Chromebooks and Chrome-related 1:1 Solutions in the US and Europe. We’re extremely excited to work with the State of Nevada on this groundbreaking initiative,” said CTL President, Erik Stromquist. 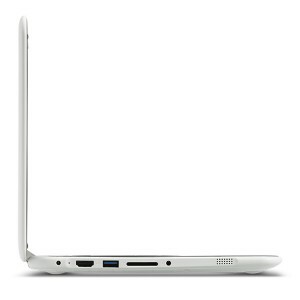 The CTL student device selected for NR21 is the CTL NL6B Chromebook for Education, a ruggedized Chromebook designed specifically for education, that CTL launched in collaboration with Intel and Google. CTL was among the first to bring this Intel-designed ruggedized Chromebook to market. Unique features include reinforced ports and hinges, non-slip texture, fanless design, anti-peel keys and 180-degree rotating camera with an optional microscope lens. 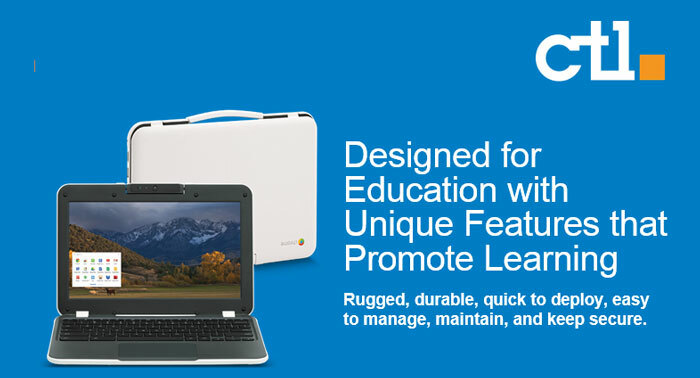 “Intel is pleased to support NR21 by offering access to Intel’s educator professional learning resources. We know that providing teachers with excellent professional development is a critical component of any successful education technology program,” said Paige Johnson, WW K12 Education Manager at Intel. The CTL solution for NR21 is a comprehensive package that includes a robust set of software and apps for education for STEM subjects, classroom management, music, video presentations, cloud-based security and more. CTL has partnered with leading companies such as Google, Intel, NcLab, WeVideo, PocketLab and others to help teachers maximize their classroom technology. NcLab® courses help students develop critical thinking, problem solving skills and perseverance by teaching computer programming and 3D modeling – essential 21st century STEM job skills. WeVideo® is a unique cloud-based collaborative video editing service that helps people from all over the world simply create and share great-looking videos. The WeVideo editor is easy enough for first-time editors, and sophisticated enough to help students create a professional-looking video. PocketLab® is a science lab that connects to the CTL NL6 Chromebook and fits in a pocket. PocketLab allows students to explore the world and build science experiments using integrated sensors including: Accelerometer; Gyroscope; Magnetometer: Pressure and Temperature. LabCamera® by intellisense allows students and teachers to conduct physics, biology and chemistry experiments by using the CTL NL6 integrated camera and the LabCamera App. Noteflight® is an online music writing application that lets students create, view, print and hear music notation with professional quality, right on their CTL NL6 Chromebook. Securly® Provides a safe and productive environment for student internet use. Simple Cloud Based Web Filtering with Granular K-12 Policy Management Delivered through the cloud, Securly provides both in-school and take-home filtering through the same admin console. Google Chrome Device Management makes it easy for school IT administrators to deploy and manage users, devices and apps across a fleet of thousands of Chromebooks. Google Classroom is a new tool in Google Apps for Education that helps teachers create and organize assignments quickly, provide feedback efficiently and communicate easily with their classes. Google Apps for Education allows teachers and students to create, share and edit files in real time. Google Apps for Education core services include Gmail, Calendar, Docs, Sheets, Slides, Hangouts and Drive. Additionally, CTL will be working with the Nevada Ready 21 program to provide professional development training as part of their 1:1 education solution package. The trainings will be designed to give education professionals timely and relevant information on EdTech tools and resources from experienced educators holding certifications such as Google Certified Educator, Google Certified Administrator and Google Certified Trainer. Both onsite trainings and webinars will be offered as well as regional events such as Google Summits. CTL is proud to partner with CISCO to provide network hardware and DynTek and Vision Technologies for installation, maintenance and support of networking wireless infrastructure at participating schools. The wireless solution will provide a robust 802.11ac network environment for student and teacher devices to access the wireless network. Founded in 1989, CTL designs and manufactures computer products including Chromebooks, desktop and mobile workstations, LED Monitors, and high performance servers. CTL® also manufactures specialty devices including ruggedized tablets, slates, and digital sign solutions. Headquartered in Beaverton, Oregon with offices in Asia and Europe, CTL® and their partners supply North American consumers, government agencies, and many of the most recognized corporate brands. For more information about CTL®, please visit www.ctl.net. To learn more about CTL’s role in the Nevada Ready 21 Program, visit http://www.ctl.info/NR21.